Tiger Bill Reviews Easy Rock Drum Beats No Reading Required DVD by Stan Mitchell from Alfred Publishing. In addition to lessons on posture, breathing, sticking, vocalizing, and counting, this DVD teaches you to play basic rock beats and fills without having to read music. Let's check it out. After a brief intro by Stan Mitchell, he covers the importance of good posture, solid drum throne, holding the sticks and striking the drum correctly. The remainder of the DVD is divided into six main chapters. The Systems: Sticking-Vocalizing-Counting. Basic rudimental sticking patterns are covered on the pad and as applied to the drumset. Includes techniques for vocalizing what you are playing and the ability to count as you play. Fills. Covered is the two-handed Pump and sixteenth-note fills. Articulation and Dynamics. Various Snare and High-Hat dynamics along with accenting is covered in this chapter topped off with a demonstration of a Drum Solo. Instructor Stan Mitchell does a good job of presenting the basic beats and fills and the band performances are a welcome addition as well. The only slight problem I noticed was a shifting of the audio quality that changed the sound of the drums and cymbals from time to time. Although I'm especially sensitive to quality issues like this, I doubt if it would bother the beginner drummer concentrating on learning the material. As such, I recommend this DVD to any beginning rock drummer and especially to those who have not yet become familiar with reading music. 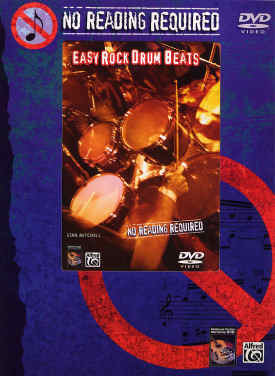 Easy Rock Drum Beats is a good value at its retail price of $14.95.